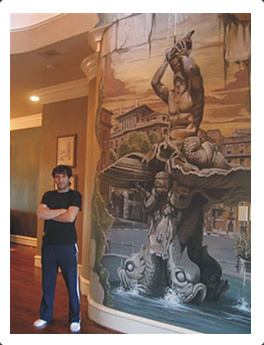 Dream Walls is a mural and decorative painting company, family owned by Alfredo and Vera Montenegro. Located in Houston Texas, founded in 2000 by Peruvian artist Alfredo Montenegro, who studied at Instituto Peruano de Publicidad in Lima- Peru and graduated in 1994 at the top of his class with a degree in Graphic Design. Alfredo recognized Vera’s Artistic talent and asked for her to start training with him. Vera has been working with Alfredo since 2008, learning over the years how to paint Murals. Through all these years of experience painting residential and commercial properties, our company combined passion and professionalism that helps us to achieve our main goal, that is the complete satisfaction of our clients. We use different mediums and techniques: oil or acrylic on canvas. Most of our murals are painted directly onto the wall and ceilings, by brush and sometimes airbrush. Faux finishes are a result of a combination of an extended gamma of products, which give a wide variety of different colors and textures. There are absolutely No limitations to the themes or the dimensions of our murals. We listen to our client’s ideas, and then offer our artistic suggestions, to create together a unique and customized mural or faux finish to fit any wall or ceiling that will complement their home or business. Dream Walls now adorn some of the most affluent homes and commercial properties in Houston and surrounding areas.